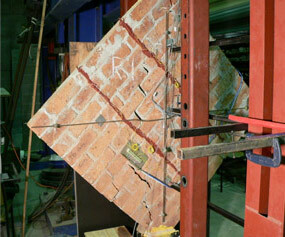 Unreinforced masonry construction is vulnerable to damage during earthquake loading as a result of its high mass and relatively low tensile strength and ductility. Much of the built infrastructure in Australia and other parts of the world uses unreinforced masonry construction. The overall aim of this project is to develop new methods for earthquake protection of brick masonry buildings using fibre reinforced polymer (FRP) strips and other forms of reinforcement which can be applied (retrofitted) to existing construction. The methods developed in this project will be able to be applied so that the aesthetic appearance of the masonry construction is not destroyed while still providing the additional strength and ductility needed to safely withstand earthquake shaking. In order to accomplish this, the fundamental bond-slip behaviour between reinforcement and brickwork under cyclic loading must first be fully understood and quantified. Design methodology based on this cyclic bond behaviour will be validated with full scale tests on actual buildings. The project involves collaboration between researchers at The University of Newcastle, The University of Adelaide and Auckland University. In addition to the investigators named above, The project involves numerous RHD students and postdoctoral researchers. Petersen, R.B., M.J. Masia and R. Seracino. Bond behavior of NSM FRP strips bonded to modern clay brick masonry prisms: Influence of strip orientation and compression perpendicular to the strip. Journal of Composites for Construction (ASCE), Submitted April 2008. Reviewed and resubmitted Oct 2008. Accepted 23 Oct 2008. Petersen, R.B., M.J. Masia and R. Seracino (2008). Experimental verification of finite element model to predict the shear behaviour of NSM FRP strengthened masonry walls. Proceedings of the 14th International Brick and Block Masonry Conference, Sydney, Australia, February 17-20, 2008. Petersen, R.B., M.J. Masia and R. Seracino (2007). 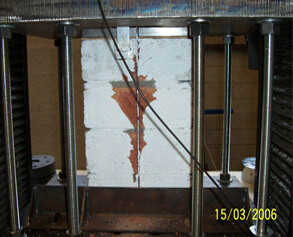 Influence of plate orientation and amount of precompression on the bond strength between NSM CFRP strips and masonry. Proceedings of the 10th North American Masonry Conference, St. Louis, Missouri, USA, June 3-6, 2007, pp. 62-73. Petersen, R. B., Seracino, R., and Masia, M. J. (2007). Development of a finite element model to simulate near-surface mounted fiber reinforced polymer strengthened unreinforced masonry walls. In Ninth U.S. National Congress on Computational Mechanics, San Francisco, California, U.S.A. July 2007. Shrive, N.G., M.M. Reda Taha and M.J. Masia (2004). Restoration and Strengthening with Fibre Reinforced Polymers: Issues to Consider. Proceedings of The Fourth International Seminar On Structural Analysis of Historical Constructions, Padova, Italy, Nov 10 – 13, 2004, pp. 829-835. Masia, M.J. and N.G. Shrive (2003). Carbon fibre reinforced polymer wrapping for the rehabilitation of masonry columns. Canadian Journal of Civil Engineering Vol. 30, No. 4, Aug 2003, pp. 734-744. Shrive, N.G., M.J. Masia and S.L. Lissel (2001). Strengthening rehabilitation of masonry using fibre reinforced polymers. Proc. 3rd International Seminar on Structural Analysis of Historical Constructions, Guimaraes, Portugal, November 7-9, 2001, pp. 1047-1056. Masia, M.J., N.G. Shrive and D. Tilleman (2001). Rehabilitation of masonry columns using carbon fibre wraps. Proc. 9th Canadian Masonry Symposium, Fredericton, New Brunswick, Canada, 4-6 June, 2001.